As we prepare to celebrate during the holidays, people collectively think of how they can help others. That spirit guides all of us at ACE, 365 days a year, in our mission to share gifts of knowledge, support and advocacy for the more than 4.6 million Canadians living with arthritis. I'd like to ask all of you in 2014 to think of what you can share or "gift" our community by contributing stories, information or arthritis wisdom to arthritisbroadcastnetwork.org. When you do, you become part of a "family" across the country and around the world working together to help people who are stricken with arthritis, to get better. To be happier. To have families. To hold onto their job, or to get a job. To see the promise of a day without arthritis. Our team at ACE will continue to call for the promotion of earlier diagnosis, the increased availability of improved treatment options, strategies on how to live a full life and to be physically active, to help improve daily living for those with one of the more than 100 types of arthritis that exist today. As a person living with rheumatoid arthritis, I want to thank all of my arthritis peers for their strength and courage to persevere over their disease and to be so giving of their time, energy and effort to help others who live with, or work on behalf of, people with arthritis. 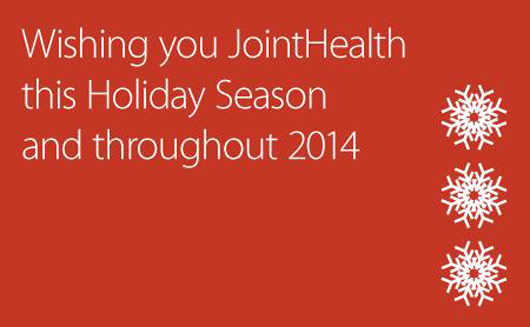 Wishing you all happy holidays and JointHealth in 2014!